Why a Business Consultant or Business Coach won’t work! To make my point, I’m gonna start with a lesson I’ve learned as a Mechanical Engineer studying, designing, building, and racing cars in college. 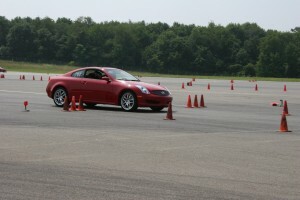 Me autocrossing my 2006 G35 at BeaveRun in 2007. So how do you obtain that “slight edge” in racing? An engineer has 2 ways to address a problem. 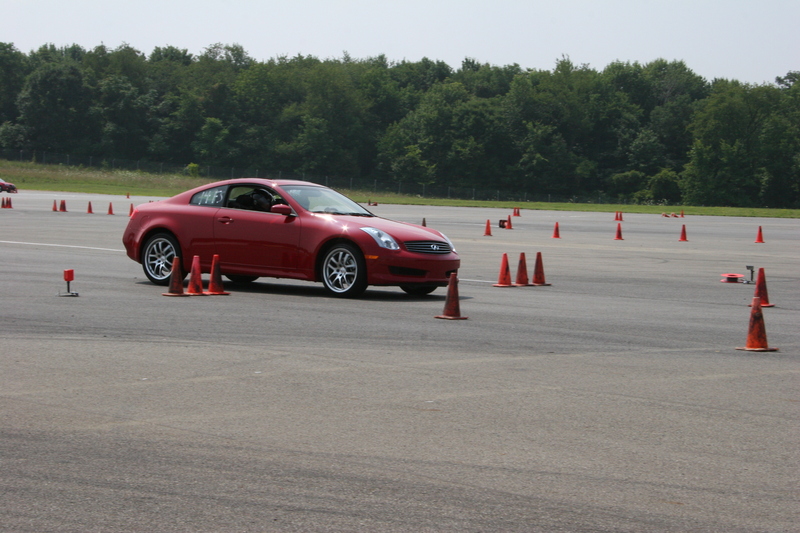 A driver goes out for a 6 lap test drive and says a car has a lot of understeer. The engineer adds 2 degrees to the front spoiler and sends the driver out for another 6 laps. Now it understeers less but still understeers. He adds 2 more degrees to the front and the driver heads out for another 6 test laps. Now it oversteers so the engineer subtracts 1 degree from the front spoiler and again out for another 6 laps. Finally the engineer adds another half degree and after 6 more laps the driver confirms that the handling is neutral. That took a LOT of time, money, rented track time, and energy. A total of 30 laps to accurately setup and test the car to come up with 3.5 degrees added to the front spoiler. This is how most business owners tackle problems. A better way to improve the car is for the engineer to listen to the driver indicate understeer, evaluate the data (because he knows the correct data to review AND how to interpret it) to determine the cars Aero balance is at 36.9%. Then he compares that data to when the car was setup perfectly on a similar track and determines that an aero balance of 38.3% is needed. He makes a single adjustment to the front to add 3.6 degrees and the car is perfectly neutral the first time. A total of 12 laps and he knows the car is setup well. This is how business owners should tackle problems. Now before you start saying, in the real world of business and dealing with people things are never that perfect. In reality, in racing it’s never that perfect either. Drivers are good, but they aren’t that good. They also aren’t generally very consistent and, in reality, they aren’t “sensitive” enough to feel slight variations. Moreover, weather, cross-winds, other drivers on the track, and a thousand other items can make choosing a “perfect” setup challenging. Which is why we’re never looking for perfect. We don’t need to be perfect. We just need to have a slight advantage over the competition. That’s why the Team Leader for our race team used to point out to us when we were getting TOO wrapped up in the perfect simulations or calculations that “We’re engineers not scientists.” In other words, we live and work in the real world where your gut instinct and experience will ALWAYS be a factor in making decisions because you’ll never be able to test every single variable. On the other hand, scientists setup controlled environments so that they can test and control each variable. As a business owner, your job is like that of the engineers relying on science, data, driver-input AND experience to make the best decisions. And that is why business consultants and coaches don’t work! Let me explain. The same is true of someone who wants to help you improve your business. They need experience in running, owning, AND analyzing a business. Business coaches and consultants can both reasonably have this prerequisite. They need data about the business. In other words, when a car is setup with hundreds of sensors to acquire data, they need to not only have access to that data, but they also need to know how to look at the relevant data and discard the irrelevant information. If the consultant or coach could reasonably have this skill however, there are plenty out there who are looking at the “wrong” numbers or skipping over some of the most important data. Quite often, they over-complicate it. For instance, in the example above, the engineer could have considered tires, anti-roll bars, springs, aerodynamics and even driver error in getting the car setup correctly. Experience told him exactly which data to review, however. For comparable data, your coach or consultant needs experience AND data working with similar businesses. Think about it for a second. What conversion rate is reasonable for your business? If you have an accounting office is your conversion rate going to be the same as a woman’s clothing store? Probably not. When you have comparable data, you can now better determine which areas present the greatest area of improvement so that your time is always being invested on the projects that will give you the best ROI. This is where the rubber of the 80/20 rule meets the road. Just because you know there are 20% of things you can do to give you 80% of the results, doesn’t mean you know WHICH 20%. Industry specific consultants and coaches may have this data and experience, however most consultants and coaches are trying to be everything to everyone so look out for this. Finally, the variables on the racetrack and in your business are ALWAYS changing. It’s not enough to be given a plan of action by your consultant and then be asked to implement it as he walks out the door (as is normally the case). It’s also not enough for your coach to call you every week or month and tweak your plan for real-world circumstances. To be truly effective, that coach needs to be constantly comparing your business to other similar businesses and providing you with input. Along the way both of you will develop the experience needed to make better gut choices when everything can’t be calculated and moreover, you’ll better understand how other similar businesses are tackling the same problems you are. No business owner, coach, or consultant will have all the answers so continually reviewing problems and solutions from a group of similar businesses can help everyone involved more quickly achieve excellent results (i.e. more profits with less time input). As you know by now, I don’t write about problems in business without offering a solution. The solution is the Small Business Engineer leading a team of small business owners in the same industry. Just like the engineer at the racetrack, the Small Business Engineer will continually work with the driver (i.e. owner) to gather real-world feedback. He’ll help you determine exactly which data (i.e. reports) to be watching and help interpret the changes. He’ll provide data from similar racetracks (i.e. other businesses in your industry) to help you get up to speed more quickly and determine which 20% you should always be focusing on. Whether for a business or a racecar, the engineer’s job is to help improve the problem as quickly, effectively and cheaply as possible. Once that’s done, your business can now have the slight edge it needs to blow away your competition. If you’re interested in learning more about working with the Small Business Engineer, comment or email (bryan@ethicalbusinessbuilder.com) me. P.S. For more information on what numbers to watch in your business, check out my 5 part series on how to fix your business fast. I really loved your post. You should keep them coming. Best Regards .